JTextArea allows you to input and edit multiple lines of text. JTextArea also generates document events so the application that wants to receive the events must implement the DocumentListener interface. 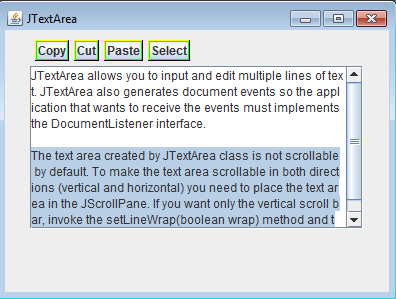 The text area created by JTextArea class is not scrollable by default. To make the text area scrollable in both directions (vertical and horizontal) you need to place the text area in the JScrollPane. If you want only the vertical scroll bar, invoke the setLineWrap(boolean wrap) method and the wrap's value is true. creates a text area with text. creates a text area with specified number of rows and columns. creates a text area with text and specified number of rows and columns. creates a text area with specified document model. copies the selected text in the text area. cuts the selected text int the text area. gets text of the text area. selects a range of text from start to end. selects text in the text area. sets the text of the text area.